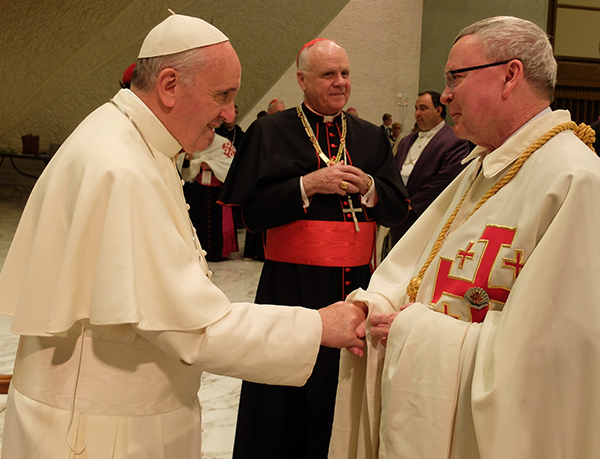 nspirational meeting: Peter Carroll meets Pope Francis during the Equestrian Order of the Holy Sepulchre’s recent gathering in Rome as the order’s Pro-Grandmaster Cardinal Edwin O’Brien watches on. QUEENSLAND’S leader of the Equestrian Order of the Holy Sepulchre has been busy since his investiture last year. Peter Carroll attended a gathering of leaders of the order with 55 other lieutenants in Rome from September 10 to 12, followed by a pilgrimage with 4000 EOHS members. Now he’s preparing to welcome the order’s Pro-Grandmaster Cardinal Edwin O’Brien to Brisbane in the coming weeks. Mr Carroll had an opportunity to meet with the cardinal in Rome and to discuss his visit to Brisbane from Monday, November 11, to Thursday, November 14. “I asked Cardinal O’Brien whether he would be interested in speaking to young Catholics at Faith on Tap at Kangaroo Point’s Pineapple Hotel on the Monday night,” Mr Carroll said. During his time in Brisbane, Cardinal O’Brien will speak at St Joseph’s College, Gregory Terrace, and at a breakfast open to the public at the Brisbane Club on November 12. Cardinal O’Brien will invest Brisbane Archbishop Mark Coleridge as the Queensland lieutenancy’s grand prior. He will also visit other lieutenancies in Australia and New Zealand. Mr Carroll said the order continued to play an important part in supporting the Christian Church in the Holy Land. “Christianity is facing a crisis in the Holy Land – in 1947 there were about 600,000 Christians with numbers now at about 100,000,” he said. “Last year $20 million raised by members went to the Latin Patriarchate in the Holy Land. The Equestrian Order of the Holy Sepulchre of Jerusalem goes back to the first knights that were established by Godfrey de Bouillon around the Sepulchre of Our Lord as a guard of honour immediately after the conquest of Jerusalem in 1099. Pope Pascal II approved the order in a Bull of Approbation in February 1113.